02-Jun-2007 -- On this trip we decided to take our time attempting two confluence’s 27s 124e and 27s 123e. On previous trips we always spend the majority of the time driving to and from our destinations without really taking the time to appreciate the countryside. However this occasion we decided to take our time and take a few extra days off work to make it a 5-day round trip. Our first planned destination was 27S 124E. 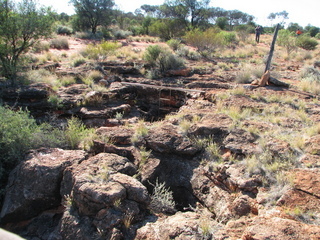 This point is 240 kilometres northeast of Laverton on the border of the Gibson and Great Victoria Deserts. It also happens to be 44 kilometres away from Empress Springs, a place our historian buff Ron has long since wanted to visit. The only problem with this attempt is that is situated 40 kilometres from the nearest track through vegetated sand ridge country and the current Google Earth photo of the area is of very poor resolution. It made planning a route of least resistance difficult, so we ended up digitising a route in running parallel with the sand ridges from the topographic maps, hoping that the scrub wasn’t too thick when we got there. We left Kalgoorlie early on Friday morning and traveled north along the bitumen towards Laverton. Along the way we stopped at the old ghost town of Gwalia for lunch and a brew. Gwalia is probably the best example of an old mining town in Western Australia. A few of the original tin houses and shops that were built early last century during the gold rush are still standing in relatively good condition and offer a good insight into how harsh life would have been for those early pioneers. After a bit of a look around we continued on to Laverton where we left the bitumen and followed the Great Central Road up through Cosmo Newberry until we came to the turnoff to Empress Springs. Sixty kilometres up this track we arrived at the Springs just after nightfall and made camp. Empress Springs was first documented by one of Western Australia’s early explorers, David Carnegie in 1896. He and a party of 4 other men plus 9 camels set off from Coolgardie on a 1600km expedition to Halls Creek through unexplored land hoping to find suitable pastoral or gold prospect areas. After 4 weeks of travel Carnegie’s party were dangerously close to running out of water when by chance they came across an aboriginal bushman whom they captured. They fed him salted beef to encourage friendship and more importantly promote his thirst so that he would lead them to his source of water. After restraining him overnight he eventually succumbed to his thirst and early the next day led them to a source in a nearby underground cave. This supply saved the lives of the men and Carnegie named the cave “Empress Springs” in honour of Queen Victoria the long reigning English monarch of the period and went into great detail in describing the cave and the surrounding countryside in his journal. Early the next morning we descended down into the cave and found the source of water at the lowest point of a very small decline as he had described a century earlier. After around half an hour of exploring and taking photos of the cave we came back to the surface and compared the present day surrounding land feature against what Carnegie had documented in his journal. Clearly evident from the top of a nearby sand ridge to the north were all his landforms he had described. After our bit of exploring by mid morning we had packed up camp and were heading back south. We soon came to the point where we planned to leave the track and follow our digitised GPS route in. Unfortunately the scrub we encountered was pretty thick and after unsuccessfully searching for a more suitable area to head in we decided to abandoned this attempt until a future clearer Google earth photo was made available. 40 kilometres through this scrub would have been too tough on the vehicle’s tyres. We kept on going south back to the Great Central Road and detoured east 15 kilometres to call in at the remote Tjukayirla roadhouse for lunch. Ron purchased a couple of kangaroo tails for dinner that night and after a round of pretty tasty hotdogs it was back west along the road towards our next attempt 27s 123e.